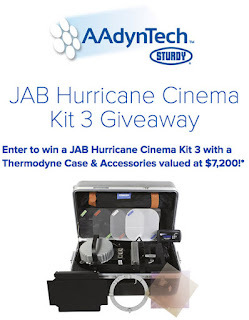 Barbizon Lighting Company Blog: Here's your chance to win an AAdynTech JAB Hurricane Kit 3! Here's your chance to win an AAdynTech JAB Hurricane Kit 3! AAdynTech has a promotion going through March 14th, 2018 where someone will win a JAB Hurricane Cinema Kit 3 with a Thermodyne Case & Accessories. The AAdynTech JAB Hurricane Cinema is the most powerful compact all-weather IP65 rated 92+ CRI LED fixture available on the market today. Designed, developed, engineered and assembled in the USA using CREE LEDs, our groundbreaking fixtures are sought by lighting professionals and field crews worldwide and have illuminated some of the most prestigious events such as the London and Sochi Olympics, Major League Baseball World Series, the Daytime Emmy Awards and several feature films.